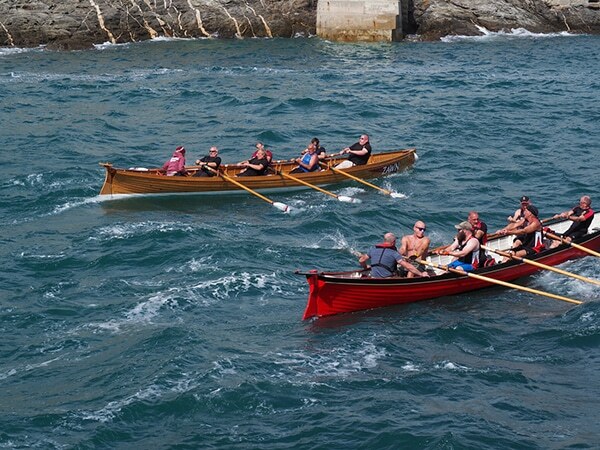 Join us for this unique opportunity to row traditional Cornish pilot gigs in the birthplace of gig racing. With the added bonus of the opportunity to experience the beautiful south Cornwall coast in England. Rowing is a surprisingly diverse sport, although all variations involve facing backwards and using oars. A whole category of rowing involves fixed seat boats. This was the original approach before sliding seats were invented. Think dories, fishing boats, Thames skiffs and cutters. 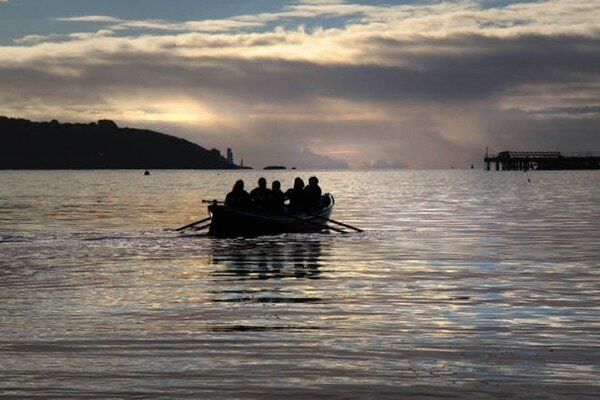 History is wound into many styles of fixed rowing, with Cornish Pilot Gigs holding a place of honour. These are fast and seaworthy craft, with 6 rowers and a pedigree going back to the 17th Century. Back in the day, sailing vessels arriving from exotic destinations would make the safe harbour of Falmouth their first port of call. Local pilots would be required to guide the ships in. Teams of gig rowers waited to spot sails on the horizon, and then would race out to meet the ship, carrying a harbour pilot as a passenger. First one there got the job. Hence Cornish Pilot Gigs. While any racing today might be for medals and bragging rights, the rowing tradition continues. The same gigs are used each year in the World Pilot Gig Championships held in Cornwall’s Isles of Scilly. 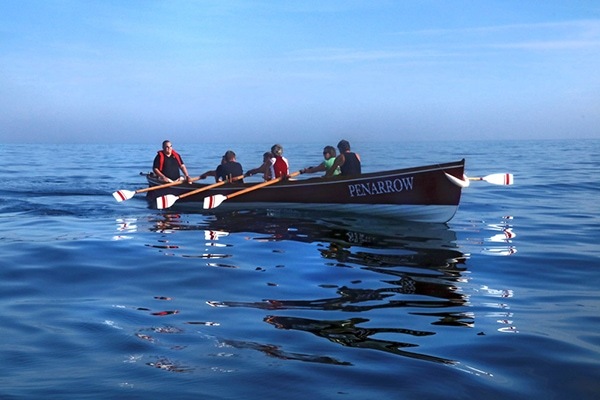 We are thrilled to offer our first fixed seat rowing tour in Falmouth, immersed in history and tradition and surrounded by beautiful landscapes. As far as we know, this is the first ever tour of this kind. Rugged and rocky Cornwall is the westernmost tip of England. 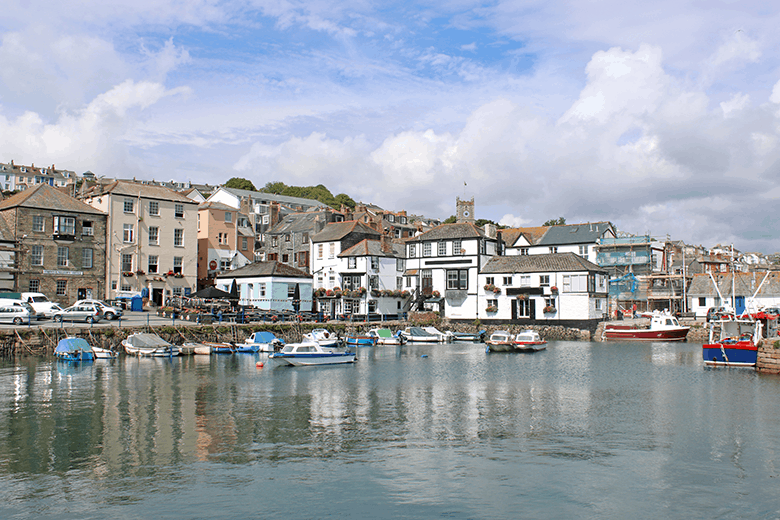 Our 2018 Coastal Cornwall tour will be based in Falmouth harbour and the river Fal. We will explore the creeks, gardens, beaches and natural maritime environment of this beautiful region. 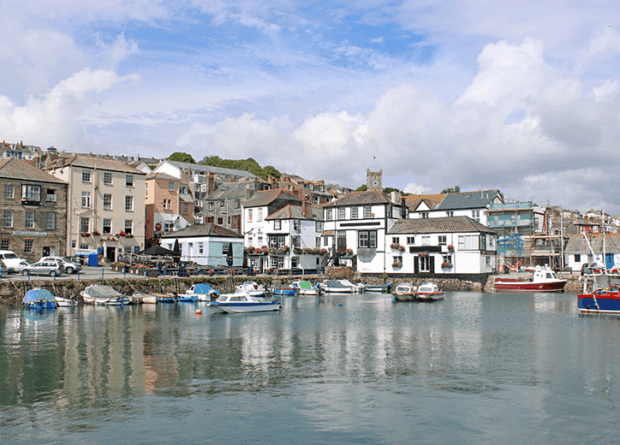 Flanked by two officially recognised ‘Areas of Outstanding Natural Beauty’ and with the South West Coast Path running alongside, the region’s coastline is a must-see attraction for walkers, swimmers and wildlife-watchers as well as for rowers. Accommodations will be in the city of Falmouth, a city famous for its maritime history, with an excellent range of restaurants, museums and art galleries. 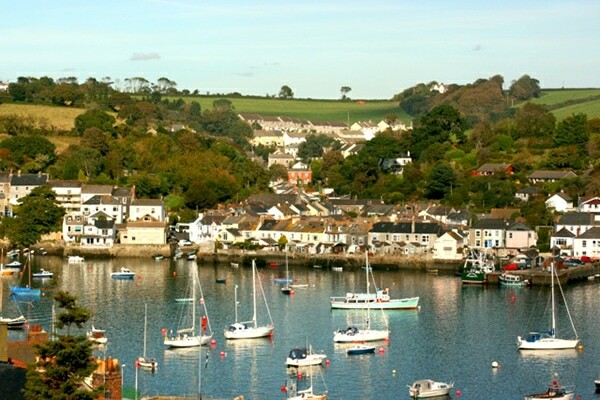 Each day we’ll explore a different part of the region, from as far as Helford Creek in the west (including the famous Frenchman’s Creek) towards the Cornish capital city of Truro in the north. This trip is offered in conjunction with Row England, as well as our local partner rowing club. Row England is best known for its tours with Thames skiffs, also fixed seat boats. This is a natural progression for them. At Rowing The World we have become more and more intrigued by all the different styles of rowing. We have now rowed fixed seats boats in California (whale boats), Ireland (cots), Italy (not sure what they were called!) and England (Thames skiffs). 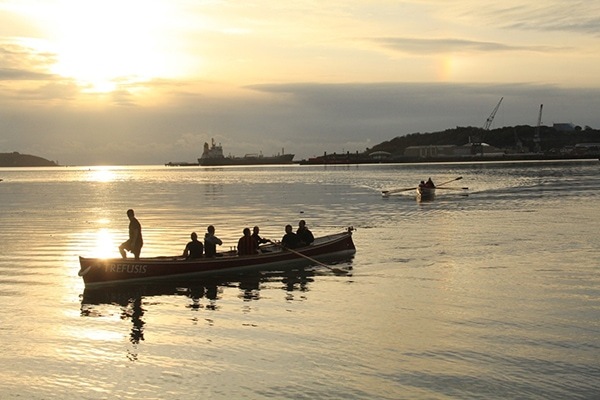 Rowing travel is all about exploring and experiencing new destinations, so why not new boats. We got a spin in a Cornish pilot gig last year, and now we are thrilled to offer this tour in conjunction with our friends and partners. All rowers are welcome. Join us if you are an experienced gig rower or row other fixed seat craft. If you are a sliding seat rower, this is a wonderful opportunity to experience a very different and historic style of rowing. Join us for this inaugrual Cornish Pilot Gig Tour! You can book this trip through our website or that of Row England. We offer credit card payment in US$ or Canadian $ and payment by wire transfer in Euros. Row England accepts payment in Pounds Sterling, whether by cheque or bank transfer or via PayPal. Single supplement price available upon request. Non-rowing companions welcomed. A Fixed Seat Rowing Tour! 6 days/5 nights with five days of rowing. Please note: we will be rowing in open sea, and weather and tides may require significant changes to the rowing program. Safety is a priority. This is an exploratory trip and the first of its kind – we are very confident that we will deliver a wonderful trip, but there is an element of the unknown and we ask you to be flexible and adaptable. However, this is also one of the appeals of this trip – together we learn, explore and enjoy. Arrival in Falmouth. Sunday afternoon and evening. Transfer from Newquay Airport or train station to hotel. Evening meal in hotel and Tour welcome. Row Falmouth Harbour. Monday. Ferry to Flushing. Rowing in Falmouth Harbour and Carrick Roads. Post-row social in Flushing. Ferry to Falmouth. 13Km. Percuil Creek and St Mawes. Tuesday. Ferry to Flushing. Percuil Creek and St Mawes for lunch. Ferry to Falmouth. 13Km. Truro River and Trelissick Gardens. Wednesday. Truro River to Malpas for lunch. Tea in National Trust Trelissick Gardens. 13 – 15Km row. Optionally more if Truro river explored. Transport to Falmouth. Helford Creek and Trebah Gardens. Thursday. Trailering to Helford Creek. Explore Helford as far as Gweek and lunch in Ferry Boat Inn. Explore Trebah Gardens. Transport to Falmouth. Evening Race with Flushing & Mylor Pilot Gig Club. St Mawes for Breakfast. Friday. Morning row to St. Mawes. Tour Lunch in Flushing. Afternoon transport to Newquay Airport or local train station. 8 Km.